Tali'Zorah nar Rayya is a quarian and a member of Commander Shepard's squad. She is the daughter of Rael'Zorah, a member of the Admiralty Board. Though young, Tali is a mechanical genius. In 2183, she is on her Pilgrimage, the rite of passage to prove her worth and bring something of value back to her people aboard the Migrant Fleet. In 2185, having completed her Pilgrimage, Tali has been entrusted with leading an important research mission for the Admiralty Board. “You've got to walk your own path...” — Spoilers for Mass Effect: Homeworlds follow. Tali sets off on her Pilgrimage aboard the vessel Honorata, crewed by Keenah'Breizh. She plans to begin her Pilgrimage at Illium, but en route through the Crescent Nebula, the Honorata detects a geth presence on an unidentified ice world. Tali and Keenah land to investigate, and manage to disable a geth unit and successfully extract its memory core, which contains a recording of two individuals discussing an attack on the human colony of Eden Prime and the coming of the Reapers. Fearing that the rest of the galaxy may be in danger, Tali convinces Keenah that they should turn over the recording to the local authorities on Illium. At that moment, the turian mercenary Jacobus and his team, on the planet under Saren Arterius' orders to find Prothean technology, attack them. They flee to the Honorata and set a course for Illium. Once there, Illium's docking officials, prejudiced against quarians, refuse to allow the Honorata to land for several hours. This gives Jacobus enough time to land on Illium first and plan an ambush. When the Honorata finally lands, Tali and the crew immediately come under fire, and the Honorata's other crew member is killed. Unable to return to their ship, Tali and Keenah stow away on a transport ship bound for the Citadel, where they hope to give the geth recording to the Citadel Council. The transport's crew discover the stowaways, but the captain decides to turn them over to C-Sec instead of killing them. They try to explain to Chellick that they have important information for the Council, but he ignores them and warns them to leave the station in the next day. After learning from Avina that there is a seven month wait for an audience with the Council, they are spotted by Jacobus, who chases them across the Citadel. Tali is shot in her side during the chase, but Keenah is mortally wounded. Arriving at an incinerator deep inside the Citadel, Keenah can no longer keep up with Tali and dies. Tali leaves her friend and sets up a trap of her own for Jacobus. When the turian enters the incinerator, she seals the doors behind him and activates it, burning him alive. Arriving at the clinic, Tali is treated by a doctor, to whom she tells the story of her journey and the information she obtained from the geth. A volus mentions that he is an information broker and can contact the Shadow Broker to ensure that Tali's information can reach the right people. He encourages her to trust him and directs her to a bar where she can hide out. Tali agrees and asks where to go. Tali was born in 2161 aboard the Rayya. Having reached maturity, she departed the Migrant Fleet on her Pilgrimage. On her travels she began hearing reports of geth, who had never ventured beyond the Perseus Veil since driving her people into exile, and became curious. She tracked a patrol of geth to an uncharted planet, waited until one was separated from its unit, then disabled it and removed its memory core. She recovered a file from its audio banks that revealed Saren Arterius was behind the attack on Eden Prime, but possessing the file put her in grave danger. She was pursued by Saren's forces, and escaped to the Citadel. On her way, Tali was shot and had to go to the Med Clinic for treatment. She told Dr. Chloe Michel she wanted to trade her information to the Shadow Broker in exchange for a hiding place, but was double-crossed by Fist who was working for Saren. She was expecting to meet the Shadow Broker in person but met a "messenger" with a group of assassins. Tali threw a tech proximity mine to defend herself, and was aided by the timely arrival of Commander Shepard's team. To repay the Commander for saving her life, Tali presents the proof that Ambassador Udina and Captain Anderson needed to get Saren's Spectre status revoked. Tali's data also provides the first mention of the ancient machine race called the Reapers, who hunted the Protheans to extinction, and the mysterious Conduit. Wanting to help fight the geth and prove herself, Tali then joins Shepard's team. Tali spends her time in the Normandy's engine room. Engineer Adams is very impressed by her knowledge, wishing his crew were half as smart as Tali. They often work together to disassemble any abandoned technology, such as old orbital probes that the Normandy's survey missions discover. Shepard can chat to Tali about her fascination with starship technology and the Normandy's unique design, especially the enormous drive core. Tali talks about life as a quarian nomad, her Pilgrimage and the ramshackle three-hundred-year old vessels in the quarian Migrant Fleet. Her mother died five years ago due to an airborne virus and although Tali is sad about this loss, such deaths are an unfortunate fact of life aboard the Flotilla. She also reveals that her father is the head of the Admiralty Board—the highest authority of the quarian people—meaning everyone has high hopes for Tali's Pilgrimage. Tali also offers some insight into the geth: why the quarians originally created them, how they rebelled, and how the neural network functions. She explains that her people struck first to try and stop the geth before the war started, but underestimated how far the geth had developed. Shepard can debate this with her, pointing out that the quarians basically attempted genocide against another sentient species. At first Tali is very excited about being on board the Alliance's most advanced vessel, but she begins having problems. She can't sleep because she's not used to a ship that runs so quietly (to a quarian, a quiet ship means a dead engine or worse, a malfunctioning air filter). She also says that compared to the crowded conditions of the Migrant Fleet, the Normandy feels disturbingly empty, "it's like half the crew is missing." She manages to adjust over time and becomes much more cheerful. Tali enjoys visiting the crowded, noisy Wards on the Citadel because they feel like home, and she particularly likes the music in Flux, hoping to take a copy back to the Flotilla. If Shepard treats Tali with respect, she is very grateful, explaining that her people are usually treated like second-class citizens. On Virmire, at the salarian camp, Tali is nervous about the upcoming assault on the base, but promises she will "fight with fire" for Shepard's sake. After the mutiny, when Shepard steals the Normandy and heads to Ilos, Tali enjoys the adventure of it all, but wonders what the Council would do if the Citadel Fleet caught up with them. Shepard is sure Tali's father would pull strings to keep his little girl out of jail, but Tali isn't convinced: stealing ships is a capital offense amongst the quarians, stating that "he'd probably want to execute us himself." If Tali goes with Shepard to Ilos, she finds the planet eerie and feels as if they are trespassing there. She claims the quarians once tried to find Ilos as a new potential homeworld, but they never expected it to feel so unwelcome. After speaking to Vigil, Tali is saddened by what happened to the Protheans—like her people, the Protheans tried to fight back against the machines, but eventually lost everything. If Shepard chooses to partake in an Alliance campaign to drive the geth away from the Armstrong Nebula, a cache of data may be found in a terminal at the main geth base on Solcrum, detailing the evolution of the geth since their split with the quarians. Back aboard the Normandy, Tali asks for a copy of the data if she is spoken to. Though it is heavily encrypted and might take years to decipher, it is a perfect gift for her Pilgrimage. Shepard can agree to her request, or refuse—it is classified Alliance data, after all, and official appeals for access can be taken down the line. If Tali receives a copy of the data, she is very grateful as it will enable her to return to her people once the mission is over. She reiterates her pledge to help stop Saren. If Shepard refuses, Tali isn't sanguine at the prospect of the Alliance actually releasing the files to the Migrant Fleet. She pouts at Shepard putting humanity's interests at the expense of the quarians, and she opts to leave the crew as soon as the mission is over—in order to find something of equal value and complete her Pilgrimage on her own. Energy Drain Unlocked when Tali is loyal. After the attack on the SSV Normandy, and having completed her Pilgrimage, Tali joined the crew of the Neema and became a respected figure in the Migrant Fleet, earning the title Tali'Zorah vas Neema. She also gained a new environmental suit, reflecting her status as a mature adult quarian. In 2185, she led a mission to the human colony of Freedom's Progress, searching for a missing quarian named Veetor'Nara who had been helping the colonists as part of his Pilgrimage. Tali and her team arrive to find Freedom's Progress eerily deserted, but with the security mechs activated. Tali guesses Veetor is responsible for turning the mechs on. During the search for Veetor, Tali runs into Commander Shepard—who arrived to investigate the disappearances with Jacob Taylor and Miranda Lawson, and whom she believed was long-dead during the Normandy's destruction. Tali is initially thrilled to find Shepard alive, but is surprised and disappointed to see the Commander working with Cerberus, due to the organization's anti-alien reputation, and recent act of sabotage against the Flotilla. Tali convinces herself that Shepard is undercover and, hopefully, working to bring Cerberus down. If Shepard gave Tali the data from the rogue geth two years previously, then Shepard could ask Tali if the geth data helped her complete her pilgrimage; to which Tali said that it did, which convinces her that even though the Commander now works for Cerberus, it's still the same Shepard. After finding Veetor, and evidence that the Collectors are behind the colony's disappearance, Shepard decides whether to let Tali return the traumatized quarian back to the Flotilla or hand him over to Cerberus for further interrogation (Tali's response is determined by this decision). Regardless of Shepard's choice, they part ways as Tali returns to the Flotilla: she has an important mission in geth-controlled space that she couldn't discuss. This mission is, in fact, on the planet Haestrom to gather data on the planet's prematurely dying sun. As Haestrom is deep in geth territory, Tali travels with a contingent of quarian marines, including Kal'Reegar, for protection. Unfortunately, a geth patrol ship sights the quarians and begins dropping troops; the quarian marines are killed and Tali is trapped inside a building with the data she has gathered. Fortunately she is contacted by Shepard, who came to Haestrom in the hope of recruiting her. After fighting their way through the geth, meeting Kal'Reegar, and destroying a powerful Geth Colossus, Shepard's team manages to rescue Tali, who agrees to join Shepard's cause. She explains that the data she has gathered on Haestrom's sun proves it is dying too quickly, possibly (as is elaborated later) due to dark energy affecting the mass of the star. Despondent over the deaths of her friends during the mission, Tali angrily hopes that the Admiralty Board will put this information to good use, and make it worth such a terrible cost. Aboard the Normandy SR-2, Jacob welcomes Tali warmly, but she dismisses him, reiterating her skepticism towards Cerberus' intentions. She makes it clear that she is joining the mission for Shepard's sake, not Cerberus'; if Shepard dealt with Cerberus experiments back in 2183, Tali reminds the Commander that Cerberus thought that enslaving Thorian Creepers and rachni was a good idea. In parting, Tali is even more disturbed to hear that the new Normandy has an AI. After some time aboard the Normandy, Tali receives a disturbing message from home. She informs Shepard that the Admiralty Board has charged her with treason. Tali asks to be taken to the Flotilla to discover what the charges are, and plead her innocence. During the events of the mission, it is revealed that the admiralty board has decided to change Tali's title to Tali'Zorah vas Normandy. Even after her loyalty mission is completed, she will keep this title, regardless of the outcome of the mission. After both Tali's and Legion's loyalty missions are completed, a conflict arises between each other when Tali catches Legion scanning her omni tool for information on the Flotilla to be sent back to the geth. Legion maintains that it is merely warning the geth of the threat they face from the quarians' tests and their plans to attack the geth. Unless Shepard intervenes impartially, the Commander will lose one of their loyalties. If the conflict is resolved without Shepard siding with Tali or Legion, Tali thanks Legion for agreeing not to transmit the data back to geth and offers non-classified information on the Flotilla to Legion instead. If Shepard sides with Legion, then the Commander loses Tali's loyalty, but it can be regained in a later conversation. Tali is a potential romance option for a male Shepard. When Tali first joins the crew of the Normandy, Yeoman Kelly Chambers informs Shepard that Tali may wish to be "more than just good friends" and describes the noticeable signals in her body language. Kasumi Goto also notices the signs, telling Shepard that he's "all she talks about" and that he'd better be good to her. After completing her loyalty mission, Tali takes on a small fever and tells Shepard what life inside her suit is like. She says that quarians are in their suits their whole lives and that the most intimate thing that they can do with another quarian is link their suit environments. It can be dangerous and is considered their most sacred form of trust. Tali accidentally lets it slip that she trusts only Shepard that much. She initially acts nervous, stumbling over her words, and can even be accused by Shepard of blushing, though she blames it on her fever. Eventually, she confirms the Yeoman's thoughts, revealing that since the start of their adventures together fighting Saren, she had developed feelings for Shepard. Until this point, however, Tali was afraid to act on her feelings because she doubted that he could see who she truly was under her mask. She is happily surprised when Shepard proves her wrong by telling her how he feels the same way about her. Tali later apologizes for putting him on the spot, saying she was "unprofessional and selfish". She tells Shepard that he "deserves to be happy with someone" and doubts that she can do that for him. But Shepard says that he doesn't want to be with anyone else, he wants to be with Tali, and he'll do everything he can to make it work. Overjoyed to hear this, Tali tells Shepard that she wants this relationship to be real, that she must "feel [his] skin against [hers]." Unfortunately, quarians' weak immune system and dextro-amino acid chirality makes physical acts of affection dangerous, if not deadly. She thus asks that Shepard give her some time until she can adequately make herself ready. Shepard can also get intimate advice from Mordin Solus, who will suggest Shepard "self-sterilize", citing oral contact as dangerous, and forwards information packets regarding quarian physiology and positions comfortable for both species to Shepard's room. Shortly before the Normandy's entry into the Omega 4 Relay, Tali nervously goes to Shepard's room saying that she has taken several antibiotics and "herbal supplements" to bolster her immune system. Speaking nonstop (a "defensive mechanism"), she becomes visibly nervous about removing her bio-suit and having her first intimate experience. Shepard eases her worries and proceeds to remove her mask, viewing her face unobstructed for the first time. Her fears gone, Tali pounces on Shepard and passionately kisses him as the scene fades to black. Furthermore, if Tali survives the suicide mission, she informs Shepard that although she is "running a fever," has a "nasty cough," and her sinuses "are filled with something [she] can't even describe," "it was totally worth it." Should Shepard choose to bring Liara aboard the Normandy to catch up after completing the Lair of the Shadow Broker, she will ask Shepard what he is fighting for and whether it is a chance to give Tali a new homeworld. If Shepard answers in the positive, he claims it is because Tali is important to him. In reply, Liara reveals that Tali has been awestruck ever since she joined him two years ago, to which Shepard wishes Liara could have mentioned it to him at the time. Liara then reveals that had she told Shepard then, it would have ruined the fun of him finding out on his own. If Shepard had romanced Liara in 2183 and later chose to just remain friends, Liara will instead say that though she was naive, she had a vested interest in "not adding any more competition." Before returning to the Shadow Broker's ship, Liara says that she hopes the two of them will find happiness together. If she survived the suicide mission, Tali returns to the quarian fleet following Shepard's return to the Alliance. Due to her expertise with the geth, the Admiralty Board requests Tali's assistance in their campaign to retake Rannoch. If Tali was not previously exiled from the fleet, the Admiralty Board appoints her as admiral in place of her father; otherwise, Tali lends her aid in secret. Tali reunites with Shepard when the Normandy joins the quarians in the war against the geth. In the Normandy's conference room, they exchange introductory pleasantries after meeting with the admirals. If Shepard inquires why she never called earlier, Tali replies that she's aware of the Commander's own problems back on Earth, though if Shepard only cares about obtaining the quarian fleet Tali replies more apprehensively but assures the Commander they'll get what they want. Shepard also voices the assumption that she'd support the invasion, though if Tali interacted with Legion she began thinking there may be a chance for peace. Otherwise, she says she didn't think the quarians were strong enough to take on the geth. Shepard presses the issue: if Tali is an admiral, she says public disagreement among the higher-ups would divide the fleet. If she is the "dirty little secret", she still feels she owes her people. With the chat over, Tali leaves with a hint for catching up in private as she says she needs to keep things strictly business in front of the admirals. While the geth-quarian war is ongoing she takes up residence in the Normandy's war room along with Admiral Raan. If Shepard permits the private talk in the Captain's Cabin, Tali immediately voices the doubts she couldn't openly express. She feels the pressure of having 17 million lives counting on her decisions. If Shepard "comforts" her by urging acceptance of the fact people will die, Tali is reminded by something her father said: commanders mourn losses, not people. Putting people at a distance was a requisite for making the big decisions, and Tali thinks she can't do that. If Tali's just friends with Shepard and the Commander assures her she's doing everything she can, she feels regret at helping her father's research on the geth as the tech derived from his work made an invasion too good to pass up. If the evidence against Tali's father was turned over to the Admiralty Board, she apologizes to Shepard and admits that they were right. Had she been exiled, she wouldn't have been able to speak out against lunatics like Xen. If Tali was exiled, however, she muses instead that maybe exile was preferable, as that way she won't expect people to listen to her. If Tali became admiral, she takes solace in the fact she can now push back against the worst ideas, and reveals she accepted the position because of Shepard. Tali asked herself what the Commander would do, and interpreted it as taking the chance to make things better. Tali serves as the geth software expert in the team that infiltrates the geth dreadnought, and participates in the mission to deactivate transmission of the Reaper signal controlling the geth. Shortly before storming the Reaper base housing the signal on Rannoch, she marvels at the experience of setting foot on the home of her ancestors, taking in the sweeping vistas of the place. Tali claims a spot of land, hopeful that she'll have a home at the conclusion of the war. With the quarians having been nomads for centuries, Shepard asks if they can go back to living in one place. Tali replies that they've gotten used to carrying their homes with them. Shepard bends down, picks a rock, and hands it over to Tali in a symbolic gesture, who remarks that it's a start. Following the destruction of the Reaper on Rannoch, the geth are weakened and Admiral Han'Gerrel launches a full strike. The geth unit Shepard and Tali rescued from the geth dreadnought, either Legion itself, or a Geth VI constructed in its likeness, attempts to upload the Reaper code to augment all intelligences of the geth collective: an act that would restore the geth to full strength, catching the quarian fleet unaware and leading to their destruction. If Shepard allows the geth to be upgraded, Tali watches in horror as she witnesses the entirety of the Migrant Fleet crash and burn up in Rannoch's atmosphere. Filled with despair, she removes her mask, declares "I'm sorry", and commits suicide by throwing herself off a cliff. Shepard tries desperately to catch her but to no avail. If Shepard stops the geth unit from uploading the code, it becomes hostile and Tali is forced to stab it with her boot knife to save Shepard. If Legion is alive and Shepard convinces the quarians to halt their attack, peace is achieved between the quarians and the geth, and Tali watches sadly as Legion sacrifices itself to grant autonomy to all geth, but not before confirming that the answer to Legion's question—whether or not the geth have souls—was 'Yes'. If Shepard chose to side with the quarians over the geth, instead of seeing hope the victory reminds Tali of the losses she incurred: her team on Haestrom, her father, and even Legion if the platform was around. She starts thinking she isn't ready to settle down yet. In all cases where she survives the aftermath, Tali decides to rejoin the Normandy, knowing that she'd be fighting for her homeworld. Before leaving Rannoch, she takes off her mask to see the sunset. While on the Citadel, Tali coordinates her people's activities with the turians. Shepard can find her on the Presidium Commons conversing with a functionary, either a diplomat or a clerk depending on the time. Before the battle for Rannoch, Tali argues with a diplomat for medical supplies, but the turian insists that they have nothing to spare. Tali points out the quarians are willing to pay and that thousands will die without the meds, but the turian counters that with the ongoing war and the recent failed coup the turians themselves don't have much supplies to go around. Shepard can step in and reason with either party, but the end result is the same: no meds for the quarians. Tali is grateful for the token support if Shepard sides with her, or grudgingly concedes the turian's point and tells the Commander she'll talk later if otherwise. If she survived the battle for Rannoch, Tali becomes the quarians' ambassador on the Citadel. Shepard finds her conversing with a clerk, whom Tali identifies as the one who denied her asylum when she acquired evidence of Saren's treachery. The turian doesn't recognize her and Tali decides not to remind him, realizing that war is no time for petty grudges. During the aftermission lulls, Tali often banters with Garrus, EDI and Chief Engineer Adams. She and Garrus have several conversations regarding their earlier missions with Shepard. Tali also talks with EDI regarding Reaper conversion of the different races into husks, deliberating on why they haven't started converting the quarians. EDI assures her that it is not that Reapers don't consider them useful, rather that they have not encountered Tali's race in large numbers. When Tali is still not convinced, EDI tells her that the Normandy has benefited greatly from her expertise and that the quarians are a very intelligent race with an astonishing knack for engineering and technology. Tali is mollified at that and thanks EDI for her assistance to the Normandy. At yet another time, Tali discusses a new idea she has come up with: using Normandy's weapon sinks to increase the time duration of stealth mode, basing it on quarian ship practices during drive core discharge. Engineers Adams, Donnelly and Daniels try to convince her it is not a good idea as the Normandy is a state-of-the-art vessel which might be sensitive to tampering. However, owing to their good faith in Tali, they let her proceed, only to regret it since Tali's "experiment" causes a major power surge and damage to some systems. Tali sighs in defeat and starts on repairs. After the disastrous mission on Thessia, Tali goes to the Memorial Wall, conversing with either Garrus or Samantha Traynor (if the turian is absent) on the comm about Liara's distress at seeing her homeworld fall if Liara already went straight to her cabin. Tali is desperate to help Liara somehow: she wants to talk to her but fears that she is not the right person for it at the moment, as she has gained her homeworld as opposed to Liara losing hers. She suggests Garrus or Traynor to console Liara, thinking the shared experience of homeworlds burning might be a start. Both of them advise to give Liara some space, while Traynor additionally points out the quarian knows the asari better than her. When Shepard expresses distress at the direction the war is going: the fall of Palaven, Earth, now Thessia, Tali encourages them, saying the Commander was the one who always prevailed against overwhelming odds and they will always figure things out. She assures Shepard she believes in them, no matter how dark it gets. Tali becomes particularly upset after the mission on Horizon. She goes to the Port Observation deck bar, gets drunk on turian brandy, and reflects on her encounters with Miranda. Tali reveals to Shepard that although she disliked Miranda, she respected her courage to defy her father and not let him control her life. She laments that unlike Miranda, she has tried to live up to her father her whole life. If Commander Shepard chooses to activate the Crucible during the battle for Earth, Tali, along with Joker, Cortez, and any surviving squad members can be seen paying their respect to Shepard, placing the Commander's name above Anderson's on the Memorial Wall aboard the Normandy. If Tali is in the squad at the final push towards the Conduit, she will be killed by Harbinger if insufficient galactic forces have been mustered. If Tali did not survive the Suicide Mission, her role is filled in by Admiral Daro'Xen vas Moreh during the attack on the Geth Dreadnought, and Admiral Shala'Raan vas Tonbay during the final mission on Rannoch. Like Legion, Tali is essential to brokering the peace between the geth and quarians, and having either of them missing forces Shepard to make a choice between saving one of the two species, sacrificing the other. If Shepard chooses to spare the geth, a Geth Prime will be seen in her place during the final battle on Earth. After Javik's initial integration into the Normandy, Tali can be overheard on the intercom in his quarters attempting to make conversation with him. She tries to empathize with his situation, but Javik then lectures her on the mistake of creating the geth, claiming if the quarians hadn't done so they would still be masters of their own planet and would still be breathing the air evolution intended. Tali is taken aback, despite Liara warning her about Javik's demeanor. The Prothean then tells her primitive quarians were considered attractive during his cycle, but it's a shame no one can appreciate it now - except Shepard, if Tali and the Commander are in a relationship. Tali is flustered at this and demands to know how he knows, but Javik just laughs. In any case, Tali soon gets annoyed and hurriedly cuts off communication. If Shepard amicably settled Liara and Javik's confrontation after the fall of Thessia, Tali talks to Javik about it over intercom after the events at Sanctuary, although the manner in how she conducts herself depends on whether she's drunk or not. If Shepard goes to Javik's quarters first instead of talking to Tali at the bar, an inebriated Tali pesters Javik claiming he likes Liara and the crew despite acting angry all the time. When Javik points out the risk of intoxication to quarian physiology, she then claims he likes her too. Otherwise, a sober Tali merely thanks Javik for lifting Liara's spirits. During his cycle, the feelings of fellow soldiers didn't matter as there were always worse atrocities committed and the only means of coping is to be numb to it all. Tali cannot see how anyone can ignore the atrocities at Sanctuary, but Javik tells her it is easier if she's seen far worse. The quarian pities the Prothean because he had to. Javik deems her sympathy unnecessary, but appreciated nonetheless. Quarians were always emotional, and Javik believes it is because of their eco-symbiotic society. Tali posits that maybe the feelings were just genuine. If Tali is still alive and in a relationship with Shepard, she will be the first to come to Shepard's aid when the Commander gets ambushed by forces unknown. After the initial escape, however (regardless of whether a relationship exists), she will be grumpy that Shepard destroyed the sushi restaurant, mentioning that she had always wanted to go there. Shepard can invite Tali up to the personal apartment after the fiasco upon receipt of her email. When she arrives, Shepard asks about the plan for the evening and she quotes a line from the vid film 'Fleet and Flotilla', "I'm as free as the dust in the solar wind." At first, she believes Shepard has seen the vid, but is shocked when it's actually to the contrary. She then states excitedly she knows what they'll be doing for the night. Later, both of them are watching the film at the scene where she got the quote from. Shepard asks Tali if she watches it a lot; she then explains that she and her friends would watch it every time they had sleepovers when they were younger. "Let the moon's shining light hide two lovers with its rays/ Though I know that dawn will set us on course for separate ways/ I will hold this night in memory for all my living days/ Now unmasked, I feel your skin on mine." Shepard can then comment on her singing or that she's always had a thing for alien men. After her reply, the scene in the vid shows the quarian character wanting her lover to see her face, with the turian character replying back that he already has and the two embrace. Tali says that "works for her" before she and Shepard embrace as he removes her mask. If she's just friends with Shepard, Tali becomes nostalgic upon watching the vid again. She promises to send relevant links to extranet sites along with captioned animations when it's over. If Shepard holds a memorial service for Thane, the drell's former crewmates take turns in reminiscing about him. Tali speaks about how the assassin could remember everything in his life down to the smallest detail, even all of his mistakes. She says she would've been a nervous wreck if she had that ability. Tali is an optional invite to Shepard's big party. She's unavailable to attend the party until after her people's war with the geth has been resolved. At the first phase of the party, she's hanging out with Liara and Samantha Traynor in the kitchen, seated in a counter with a drink in hand and responding either drunkenly or soberly depending on the party's setting. When people marvel at the luxury of the apartment, Tali remarks she could've bought an air-conditioner for her suit judging by the electric bill the pad must've been getting; apparently she doesn't have one and it gets hot in there. If Garrus asks if they're interrupting any "plans" afoot in the "Tali-Shepard love nest", she just taunts him or responds he'll never know. If Garrus alludes to a "Traynor-Shepard love nest" instead, Tali slyly remarks that "checkmate" takes on a different meaning when Samantha replies they'll just be having "chess". When Liara says she finds galactic dialects fascinating, Tali responds with one of two things: if Tali is drunk, she says the only dialect she'll want to hear from Liara is "inebriated asari." If not, she cuts Liara's musings short, telling her such topics are the last things they should talk about in a party. If Shepard checks in on her group, Traynor worries about the Normandy, asking if anyone else tried to steal it. Tali replies they can always call Cerberus and politely ask them to build an SR-3. One of the group, either Samara or Samantha, points out that it may require Tali to change her name into something like "Tali'Zorah von Normandy SR-3", and Tali corrects them properly: vas. If she's inebriated, she goes on to explain that von means "one who has a weak bladder" - something she's feeling at the moment. The group toasts the Normandy in any case, and if Tali was romanced, she's the one to toast falling in love with its captain. When Traynor gets the guests to recount their history with Shepard, Tali recalls first meeting Shepard, and all she kept thinking then was that she hoped Shepard took a shower because her filter needs replacing and humans carry a lot of germs. Liara remarks that three years later, she's either eating Shepard's food or drinking Shepard's booze in a straw, calling it "progress." If Tali and Shepard are lovers, Liara instead deadpans that the quarian's not thinking about the germs anymore, and Traynor chimes in that Tali may still picture him in the shower. At the second phase of the party, in an energetic setting Tali is seated with Traynor and EDI on the upper floor listening to their conversation. EDI is forcing Traynor to recall her perverse attraction to the AI's then-disembodied voice, and Tali nearly poisons herself with cheese trying to change the subject, understandably creeped out by the awkward topic. In a quiet setting, Tali hangs out in the poker den with James and Liara, "acting" out the differences between the SSV Normandy and the SR-2, waving her arms around and making what sounds like approximations of machinery operations. She remarks the SR-2 is "harder" to perform, asking if that makes it better or worse. She sides with Liara who vouches for the original Normandy when the discussion devolves into sides supporting the merits of each ship. At the final phase of the party, in a quiet setting Tali hogs a bathroom on the ground floor, wasted and barely able to sit up. She apparently got an omni-tattoo/omni-tat/omni-too at Jack's suggestion, if the psychotic biotic is around. If Tali is in a relationship with Shepard, she says that Jack said he'd find such a thing hot. When Shepard asks her where she had the alleged tattoo, she says it's "down in the lower wards, near the bottom", a reference she got from Liara. If the party had everyone dancing, Tali is on the dance floor with Steve and Samantha, waving her arms and body around and rotating on the spot. She takes part in reciting atomic weights of elements, and doesn't get the reference to sixty-nine when the humans around her snigger. If Garrus calls out element 69 (thulium), she calls him a nerd. She's also amazed humans and asari can dance and don't tip over given the way their legs bend (compared to turians and quarians). If Shepard dances with the group, the guests then comment on the Commander's unique dancing technique. Tali opines that Shepard is entitled to a "few eccentricities" since they are saving the galaxy. If they're in a relationship, Tali instead remarks that Shepard's dancing is something people "learn" to love. If Shepard and Tali are just friends, Tali can be found arms on her knees in one of the bedrooms upstairs in the morning after, nursing a hangover, regardless of the setting and barely remembering anything from the previous night. If they're in a relationship, Shepard wakes to find Tali nestled beside him on his bed. If the party was energetic, she'll mention how sick she feels, and also that whoever dressed her back up messed up the clasps on her suit. If the party was calm, then Shepard will ask how she feels, to which Tali replies that she'd feel worse if she were waking up alone. On the crew's return back to the Normandy, Tali takes Shepard's hand in hers, lamenting that their shore leave is over and states that she would've never guessed before that she would be serving on a human ship and that she "wouldn't trade it for anything". Her last words to Shepard before the crew departs is that they've "had a good ride", to which Shepard replies "The best." Provided that Tali survives the suicide mission, she then meets Shepard again during the diplomatic talks with quarians. Depending on whether or not she was exiled, she's either one of the Admirals discussing the war or the Admiralty Board's "secret adviser" on the geth. After a brief discussion with the admirals, Tali and Shepard walk into another area of the ship where Shepard can inquire about their relationship. Tali informs Shepard that she can't discuss it in front of the Admirals and suggests that he invite her to his quarters for a more private conversation. If she has been invited to Shepard's quarters, Shepard may choose to continue the relationship with her. After the destruction of the Geth Dreadnought, while on a call with Tali, Javik says that quarians were considered physically attractive even during his cycle, and he suggests to her that he is aware of her relationship with Shepard. She is surprised as she didn't believe anyone would have been aware of the relationship, let alone someone whom she had just met. Alternatively, while having a conversation with Shepard about the reason he fights being for his friends and crew, Javik says he believes there is another reason: Shepard's relationship with Tali. Javik asks if Shepard and Tali are "joined." Shepard confirms this, but Javik states that he could already sense it by his pheromones. Before Shepard faces down the Reaper on Rannoch, Tali confesses her love for the Commander in lieu of Legion or the Geth VI wishing him good luck. On the Normandy, after retaking her homeworld, she states that nothing stands between them now: "whatever the galaxy throws at [them], [she] will be at [his] side." Before resuming her duties, she tells the Commander she has left him something in his room. Next to his bed, Shepard finds a picture of Tali without her mask. If Shepard chose the geth over the quarians or any possible compromise, however, not even Tali's love for the Commander would stop her from taking her own life. On the Presidium, after Tali's conversation with the turian clerk, Shepard can laud her for forgetting past grievances or encourage her to remind the turian of the past. Either way, Tali will remark that the war is bigger than old grudges. Shepard then praises Tali, saying that the difference between the two is Tali's willingness to help when it counts. Tali will shake her head and reveal that it was Shepard who made the difference in her attitude. After the mission on Thessia, Tali is seen standing by the Memorial Wall. She comforts Shepard when he expresses concern over the current direction of the war. Tali ends by enjoining Shepard to never forget he is the man she loves, no matter what. If Shepard visits Tali while she's drinking turian brandy in the Port Observation Lounge after the mission on Horizon, she proudly declares that she is having a drink with her human boyfriend and that her father would've hated Shepard. When Shepard launches the mission against the Cerberus base, Tali comes to his quarters and asks to spend the night with him. If he accepts, they remove her mask together and passionately kiss. Several hours later, Shepard awakes to find Tali putting the final pieces of her suit back together. After inquiring about her well-being, she reassures him by saying that her system has adapted to physical "contact" with him. She rejoins him in bed and they comfort each other, preparing for the confrontation with the Reapers. If neither Tali nor Garrus Vakarian is in a relationship with Shepard, the two of them eventually enter into a romantic relationship with each other, eventually getting "caught" together in the Normandy's main battery. Provided that the Commander is not romantically involved with either, their conversations over the intercom end awkwardly, revealing their mutual affection. Otherwise, their conversations end casually, indicating that the two are simply friends. If one of them is in a relationship with Shepard, Tali still visits Garrus at the main battery to say her goodbyes as well as make a wager on who can kill the most. Shepard can then thank them both for being there through everything and for believing in the Commander no matter what. Tali then comments that they will finish it the same way as it started, together. During the final mission on Earth, Tali and Shepard can say goodbye before the final battle. Tali's enthusiasm for retaking Earth falters briefly as she laments that she "wants more time" to be with Shepard. If she follows Shepard during the final charge to the Conduit, Tali gets critically injured and forcibly evacuated to the Normandy. Although she pleads with Shepard not to leave her behind, he asks her to go on living and to build a home on Rannoch, to which Tali tearfully replies that she already "has a home" and begs Shepard to come back to her. After talking with the Catalyst and deciding the fate of the galaxy, Tali will be the last person Shepard sees before ending the Reaper threat. In the aftermath of the war, Tali holds Commander Shepard's name and is poised on sticking it to the Normandy's Memorial Wall. If the Reapers were destroyed and enough of the galaxy's forces were rallied, she refrains from placing the name and the Normandy is seen flying off - and in a pile of rubble somewhere a man with an N7 armor stirs. If Shepard merged organic and synthetic life, after placing the Commander's name on the Memorial Wall Tali shares a hug with EDI. Tali carries a knife strapped to her boot, but is never seen using it until Mass Effect 3. If Shepard chooses to side with the quarians on Rannoch, Tali will use her knife to stab Legion/Geth VI in the back. In this scene and this scene alone, her knife uses the model of a broken Phantom sword. According to Tali's "Character Key", a limited edition item formerly sold in the Bioware Store, Tali stands at 172 centimeters tall, roughly 5 feet 8 inches. This is seemingly reinforced by an official miniature statue also sold in the Bioware Store; the figure is approximately 9.25 inches tall, on a 1/7 scale, and depicts Tali leaning forward with her knees bent, subtracting a noticeable amount of height compared to if she was standing with straight posture. Finally, an official statue formerly sold in the Bioware Store stands 19 inches tall at a 1/4 scale, which would be consistent with these other pieces of merchandise if the base/stand part of the figure is at 1-2 inches in height, depending on how much height Tali gains from her shoes. Tali's combat drone is nicknamed Chatika vas Paus, a reference to BioWare's Baldur's Gate II. Chiktikka Fastpaws is the raccoon companion of Baervan Wildwanderer, a deity worshiped by Aerie, one of the party members. When Chatika is summoned, Tali will occasionally cry, "Go for the optics, Chatika! Go for the optics! ", a reference to Baldur's Gate II's Minsc, who shouts, "Go for the eyes, Boo! Go for the eyes!" to Boo, his miniature giant space hamster. Aerie sometimes reacts to commands by saying, "Faster than Chiktikka Fastpaws!" while Tali may exclaim "Nothing's faster than Chatika vas Paus!" Tali and Aerie have some other similarities as well, both being the junior non-human female companion with a soft voice, a possible love interest for the main character, and having a "support" role in combat (focusing on spells or powers over weapon damage). Along with Legion, it appears that Tali was originally available for recruitment at a much earlier point in Mass Effect 2, or that certain missions were intended to be available throughout the game. According to Lukas Kristjanson, Tali was originally named "Talsi Orah, with the intent that Orah would become the familiar one". However, because the name flowed “oddly” and it was “too 'soft'” for where BioWare wanted to take the character, it was changed before the game was released. According to Matt Rhodes, showing Tali's face in Mass Effect 3 was a heavy source of debate. He drew up several different designs for her, including the one close to the final look in the game. 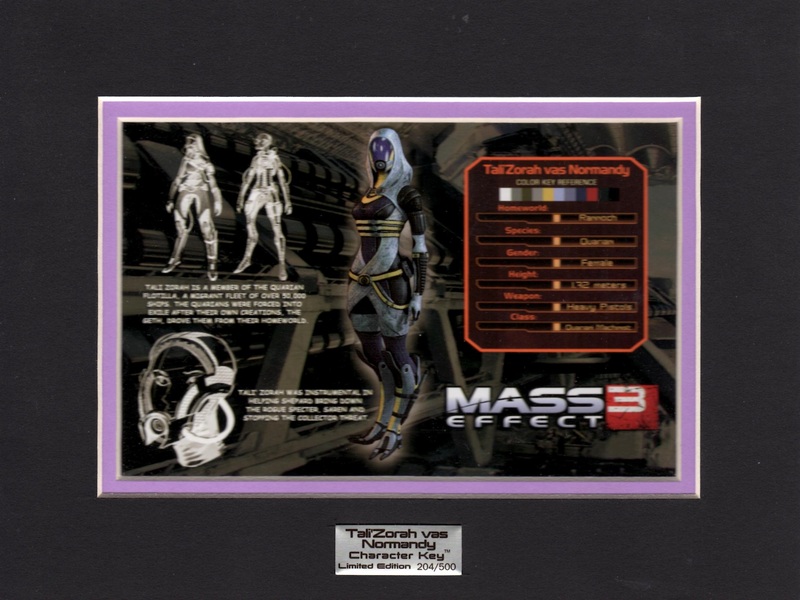 Tali's face, as can be seen in a photograph during the events of Mass Effect 3, is an edited portrait of the 2005 Miss England Hammasa Kohistani. According to Chris Priestly, Tali was almost not included in Mass Effect 3 as a full squadmate. Patrick Weekes convinced the team otherwise. Preston Watamaniuk felt that Tali had to die, no matter what, if the player sided with the geth, something that he found personally difficult having to convince the rest of the development team. As with all squad members, Tali has unique dialogue that can be heard at various locations, during missions or assignments, or if a specific squad member is in the selected team. The Shadow Broker has files on Tali which can be accessed aboard his ship. ↑ "Bioware Store: Tali'Zorah Statue Exclusive Edition". Retrieved June 1 2016. ↑ "Gaming Heads Figures: Tali'Zorah Vas Normandy" (said to have the same scale as  figure). Retrieved July 10, 2016.